Though Thanksgiving is a time for many to give thanks for what they have, it's also a time many recognize those who have not. In an effort to help those in need on Thanksgiving Day, Nov. 22, many area organizations will host a Thanksgiving dinner free of charge. One of them is Sandy Activity Night, a group organized through DD&MH Provider of Oregon in Sandy. From 4-7 p.m. Thursday, Nov. 22, volunteers with Sandy Activity Night will host a community dinner at the Community Church of Sandy, 39290 Scenic Dr.
"People who need to get out of the elements are welcome to come," noted group coordinator Patricia Kendrick. The event includes a traditional Thanksgiving dinner of turkey and ham with a side of mashed potatoes. There also will be coats from the Sandy's Helping Hands and DD&MH Provider of Oregon Operation Give Warmth coat drive available for anyone in need of winter clothing. n Sandy Assembly of God Church, 39800 Highway 26, Sandy, at 6 p.m. Thursday, Nov. 22. Call 503-668-5589 or visit www.sandyassemblyofgod.org for more information. 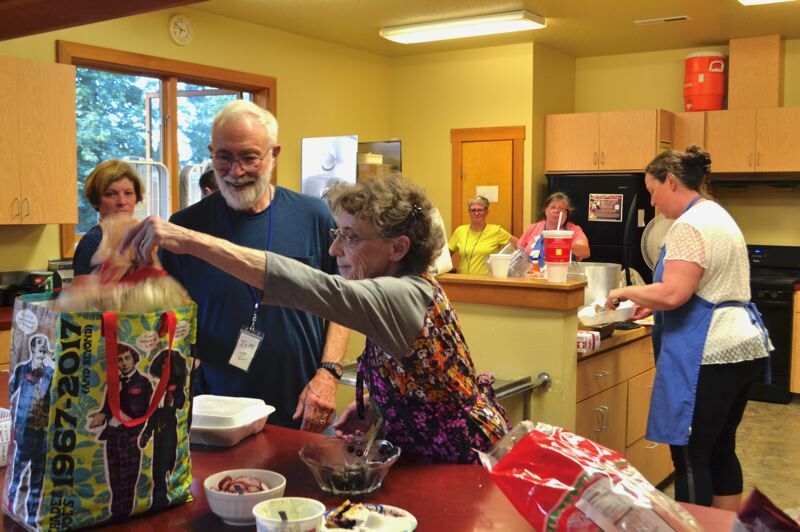 The church also offers weekly meals every third Monday of the month, except July's dinner is the second Monday and November's is on Thanksgiving Day. n Congregants of the St. Vincent de Paul Church, 18090 S.E. Langensand Road, Sandy, will provide Thanksgiving week food boxes on Wednesday, Nov. 21. For more information, call 503-668-4446 or visit www.stmichaelsandy.org. Ongoing food boxes are handed out on Thursdays throughout the year. Contact the church no later than the Tuesday before to reserve a box. "I'm looking forward to spending time with everybody in our community and providing community to those unable to have a hot meal," Kendrick noted.